If you’re looking for something VERY special for a Christmas gift for someone totally wonderful in your life I have JUST the thing, especially if you’re not short of a few Lindens! Guys you would be foolish to miss out on the latest release from the ever awesome RIA BAZAR. Backtrack; if you don’t know what Glamping is, it’s like posh camping. (‘Glamping’ comes from ‘Glamorous camping’) Now, I’ve only been camping once in deepest, darkest Norfolk, and although it was enjoyable it wasn’t an experience I’d like to repeat. For a start, I had to inflate my air-bed every night and I was waking up in the morning with a sore back because it had deflated as I dozed; and let’s not even talk about the weather. It was anything BUT glamorous, that’s for sure! Glamping however is a different concept; all the accoutrements of a hotel room but in the great outdoors. It’s incredibly luxurious and something I would like to try in real life. Sadly, you require a small mortgage to be able to experience it yourself. It may be in a ‘tent’, but it’s at premier room rates and something only the very rich and fabulous seem to be able to afford. 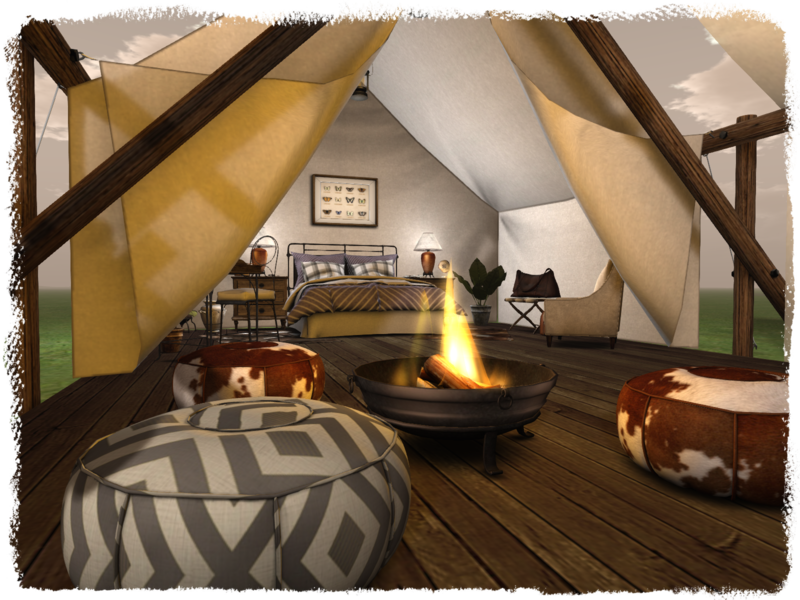 So thank goodness for Second Life, because I can enjoy the glory of glamping without having to wear wellies that leak or worrying that the gas stove won’t light. If you buy the whole set you’ll find two tents (large and small) and three pre-made furniture settings in rezzers, for super-quick setup. No moaning about lost tent pegs here! The tents are spacious (even the small one) and made with the attention to detail you would expect from a Ria Bazar design. The tents are textured perfectly, with the perfect choice of canvas and even a hardwood floor base. Not only that, but there are lanterns hanging from the tent support beams, and the doors (tent-flaps) open and close beautifully. 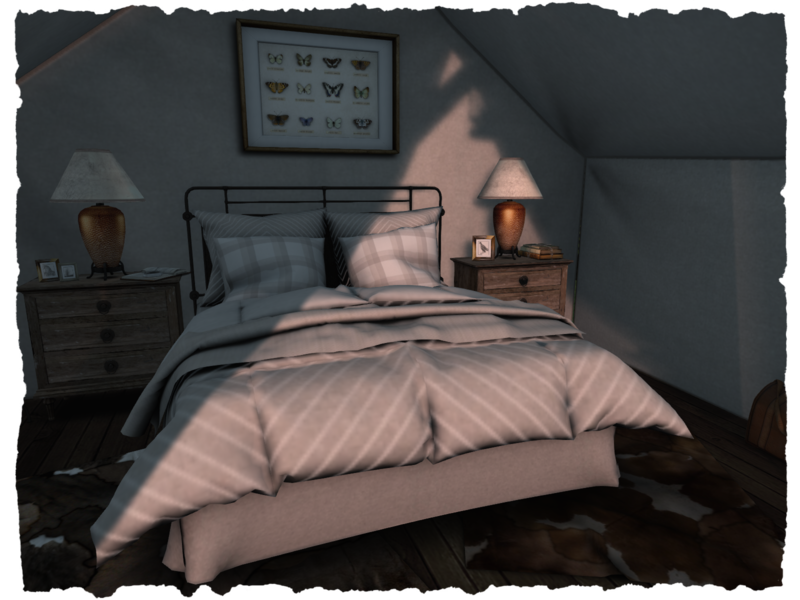 There are two furniture sets included: a double bedroom for couples with a writing desk, and a single bedroom option, for a single person or a child ( You can Rez another bed in the smaller tent and have it as a double, should you so wish. There is ample space available to do this) This is where things start to get really interesting, because as usual Ria has created some spectacular furniture boasting a myriad of options for interaction and personalisation. The beds are beautifully made and look sumptuous and ready to sink into with texture change options and covers that you can actually snuggle under. , and include, without a doubt in my mind, some of the BEST animations that you’ll find in-world. Never one to skimp on details, Ria’s included night stands that are texture change and incorporate items inside the drawers. This looks really authentic, and I particularly liked the inclusion of a few ‘naughty’ bits in the top drawer of the Double Bedroom chest! There’s also a texture changeable writing desk to match (again filled to the brim with animations), chairs, planters and surface decorations to make your tent look comfortable, all with the hint of opulence and extravagance that only Glamping could provide. 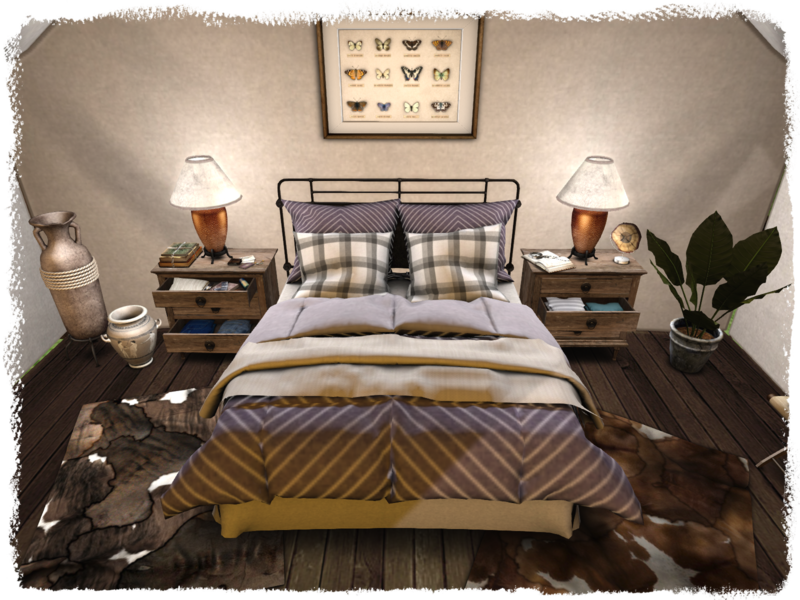 The single beds include the same extensive menu of animations and wearable, rezzable props but because of their size include children’s individual animations too. Wearable props such as a toy aeroplane and a teddy bear make a welcome addition if you want to use this in a virtual family environment, along with some lovely parent and child interactions too. Ria really has covered everything with this carefully planned set. You can even buy the set unfurnished (should you so wish, madness if you ask me) and purchase the furniture separately but personally I think your money is best spent buying the full set. It’s an absolutely fantastic purchase, and will look as much at home in a virtual camp-site as on a virtual safari. The possibilities are endless, and it’s a fantastic creation as usual from the BAZAR brand. BUT don’t take my word for it, go and visit in-world to see it, play with the animations and experience virtual Glamping for yourself! I can guarantee you won’t be disappointed, and you won’t come home empty handed either! That looks cosy! Too bad I got 49 prims left haha.